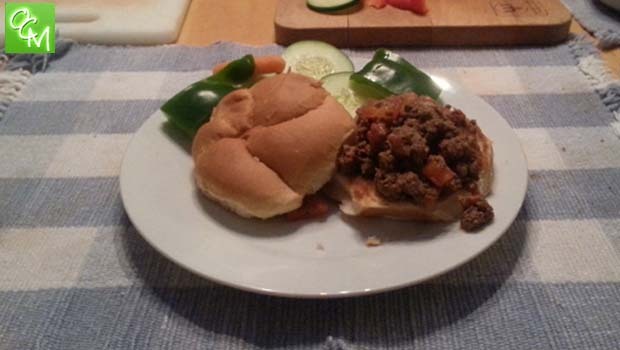 All Natural Sloppy Joes Recipe – Sloppy Joe mix that comes out of a can is just nasty. Here’s a sloppy joe recipe that is all natural and full of flavor (feel free to alter the amounts of the seasonings to your liking – these are just estimates). The grilled hamburger buns add a nice touch, and help to keep the buns from getting soggy and super sloppy. Saute onion and red pepper. Add ground beef and cook. Add seasonings. Add tomatoes and “chop” them while stirring the beef mixture. Add steak sauce. Simmer and cook off some of the liquid. Butter insides of hamburger buns and grill on a griddle till lightly browned. Add Sloppy Joe mixture and serve warm. Also goes well with cheese.